Praise the Lord for the Wonderful Rain! Reported by Tex Wright,"The Santa Anna Peaks were the high ground, or so it seems. Here at the foot of the peaks I measured 5.80 inches of rain. Emptied at 9:00Pm Saturday night. It acutally filled the cracks in my yard. Most of the rainfall was of the slow soaking kind, with very little run off here." I had about six inches in one of my gauges that measures 5.5, plus two tenths after it was emptied and the other one ran over at 4. Everything but the Fun Run has been canceled due to rain. 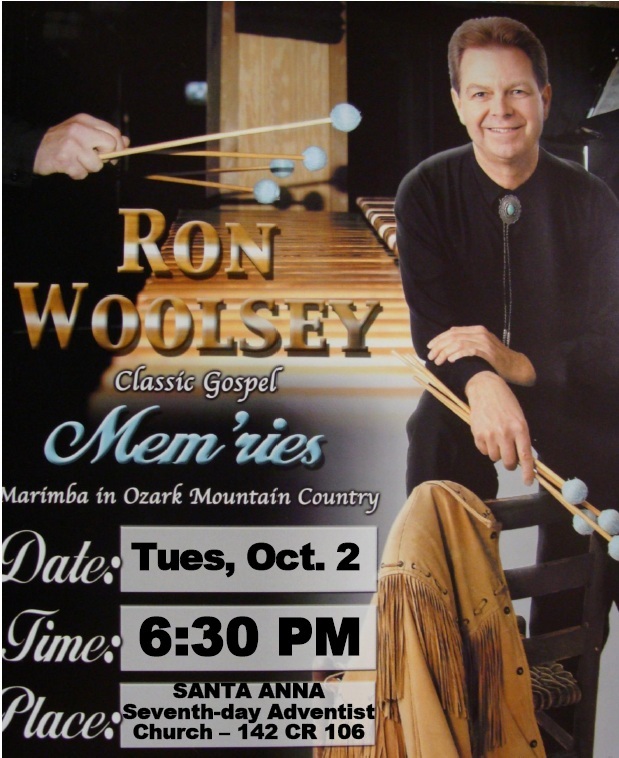 FEATURING recording artist and concert musician, RON WOOLSEY, ON THE CONCERT GRAND MARIMBA, TUESDAY, OCTOBER 2ND, starting at 6:30 PM with a free meal. The CONCERT will begin immediately after the meal, so don’t be late! Ron Woolsey is pastor of the Marshall, Arkansas Seventh-day Adventist Church, and speaker/director of The Narrow Way Ministry, a ministry of missions, message, and music. As a recording artist and concert musician, he travels extensively both nationally and abroad with his music and his testimony of divine rescue from a previous lifestyle of self-destruction, shared so that others may know that “…nothing is impossible with God”. Through pastoral ministry, speaking engagements & seminars, musical concerts, newsletters, global television appearances, his published autobiography (in English, Spanish, German and Portuguese) and his web site ministry, he contends that our God is mighty to save, the "whosoevers", from "whatsoever", even "to the uttermost." You won’t want to miss this time of food, music and testimony!! 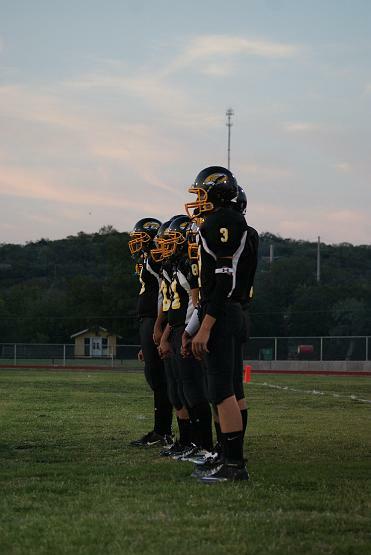 The 4-0 Santa Anna Mountaineers will take on the 1-3 Eden Bulldogs Friday September 28th at Mountaineer Stadium for a matchup of two former eleven man football rivals. The Mountaineers ranked 22nd in Division 1(34th overall) and the Bulldogs are ranked 49th in Division 1 and 107th overall. The Mountaineers are favored by 45 points over the Bulldogs in what may turn out to be a wet game, we hope. 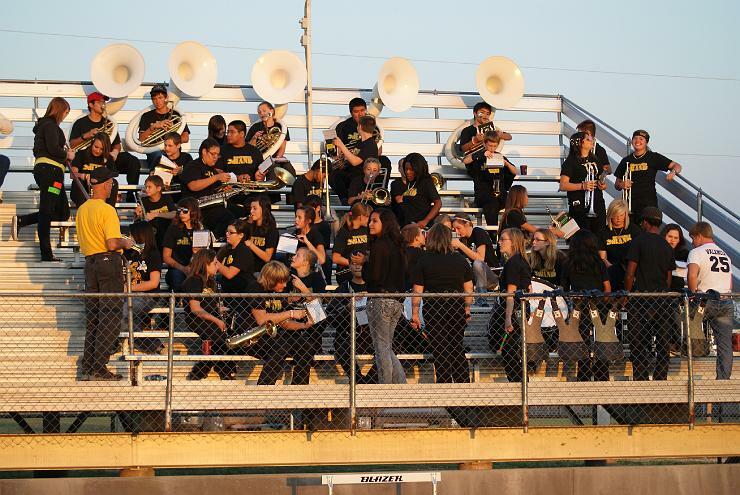 Put on your Homecoming Black and Gold, pack your poncho and umbrella, and we will see you at the game! Hail Santa Anna! Hail Mountaineers! 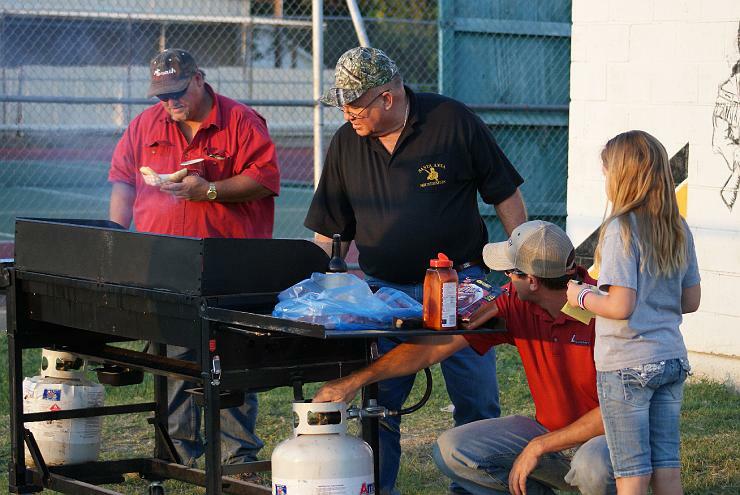 Every fall since 1953, Santa Anna High School Alumni have gathered in Santa Anna to participate in the annual Homecoming activities and to keep in touch with former classmates and teachers. 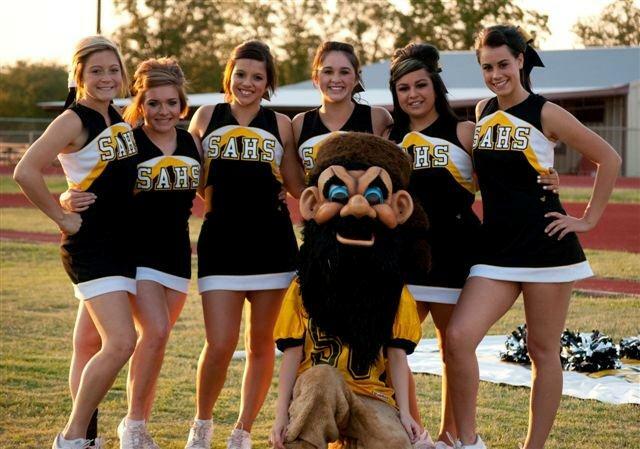 All Santa Anna Exes, former teachers, and administrators are invited to attend the annual Homecoming activities on Friday, September 28, 2012, and the Ex Student’s Association annual meeting on Saturday morning, September 29, 2102. 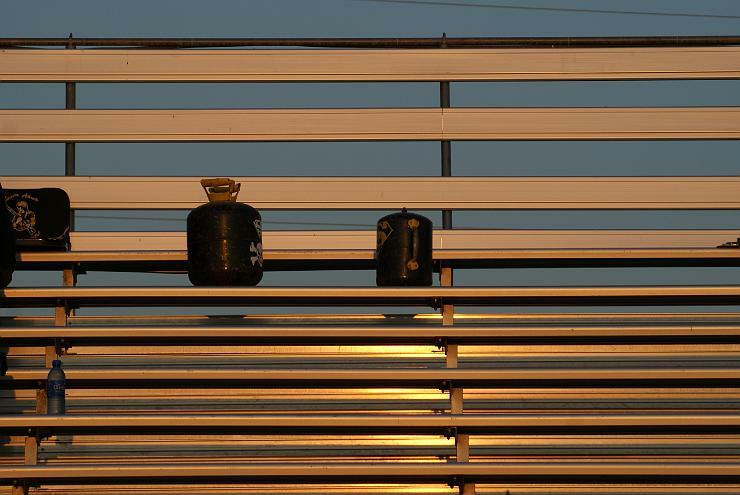 Friday, September 28, beginning at 2 p.m. the homecoming parade will be held in downtown Santa Anna, and the Pep Rally will follow immediately after at Mountaineer Stadium. The pregame ceremonies will begin at 7pm on Friday to recognize and honor the Ex Student of the Year and the Coming Home King and Queen. 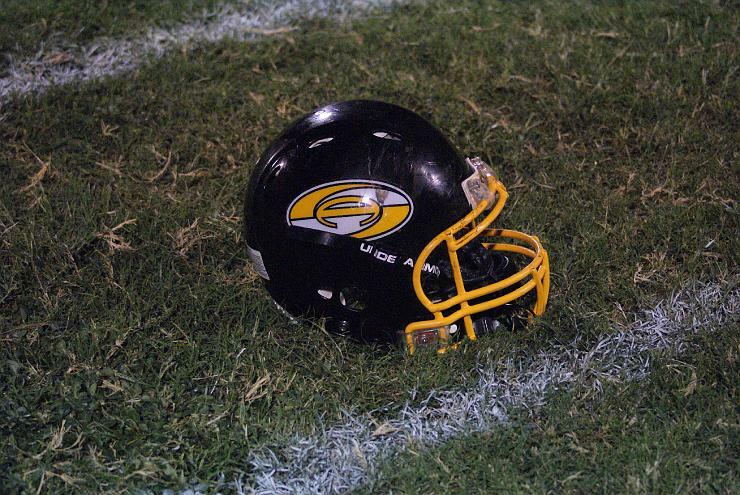 The game will feature the mighty Santa Anna Mountaineers versus the Eden Bulldogs. Friday night kickoff is scheduled for 7:30 p.m. All Mountaineers, past and present, are encouraged to come out and root for the Black and Gold. 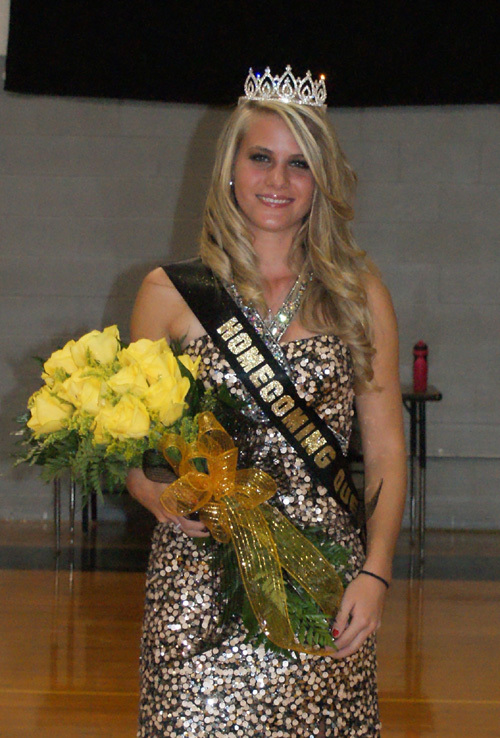 The halftime performance will feature the crowning of the 2012 Homecoming Queen. 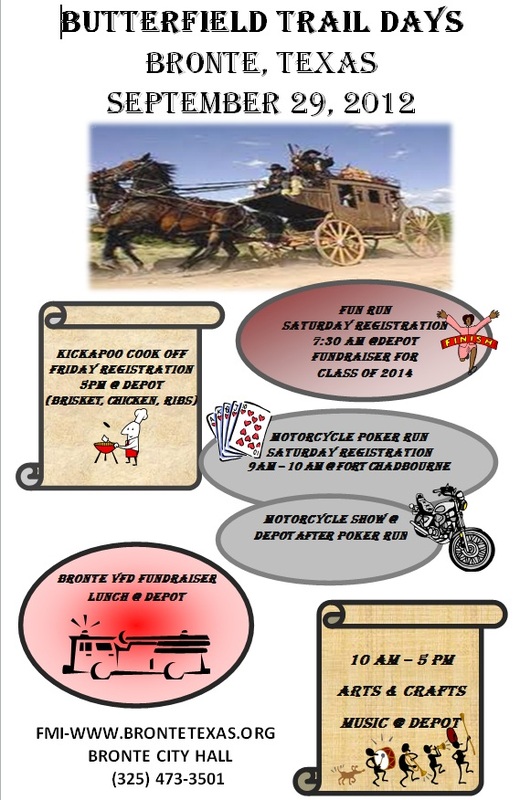 Saturday, September 29, the Santa Anna Ex Student Association’s activities include the annual business meeting and recognition of classes. Registration and coffee begin at 9am in the school cafeteria followed by the annual meeting at 10am in the High School auditorium. Following the meeting, there will be a luncheon in the school cafeteria. 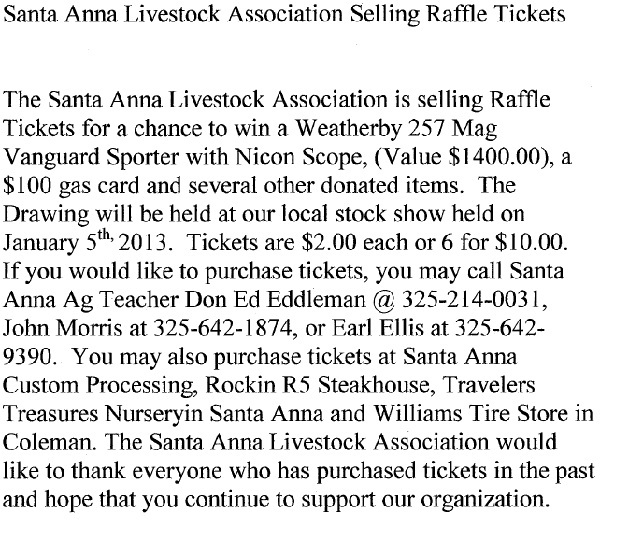 Proceeds from the luncheon will go to support the Santa Anna Mountaineer Band. Several reunions are planned for Friday and Saturday. Any reunion plans can be reported to Ex- Students Association officers Danna Jones at 325-374-4750, Chris Cheaney at 512-848-0048, or Shamey Brand at 325-214-3048. They will get your reunion plans posted. Martha Johnson is employed with TexasBank, Stephenville, Texas as a Senior Administrative Assistant. Her responsibilities include oversight of the credit department, loan audit procedures involving examinations, investigation and review of loan records while assisting the President with regulatory compliance. 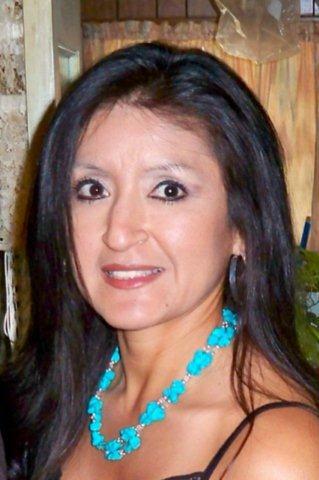 She has been employed with TexasBank, Stephenville for the past ten years. Prior to joining TexasBank, Stephenville, Martha was employed with TexasBank, Dublin where she served as teller and new accounts representative. Martha has over 15 years of banking experience. Martha is an avid runner. She has competed in countless races including a marathon in San Antonio in 2010. She is currently training for her second marathon in November. Martha has encouraged many runners to cross the finish line. 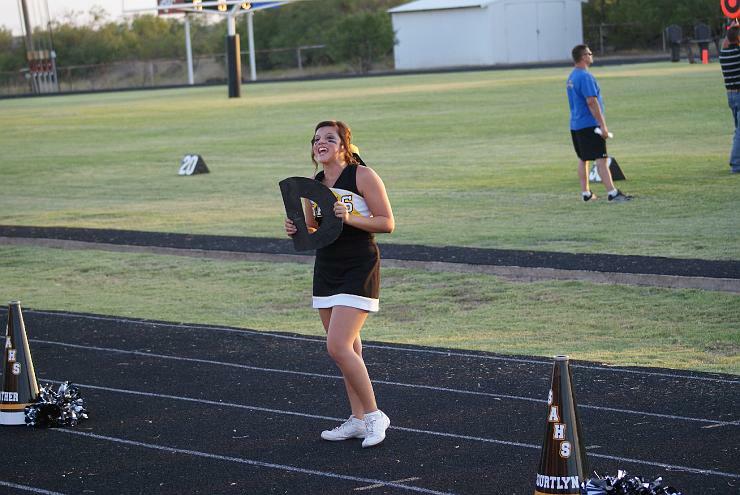 She enjoys the competition, stress relief, runner’s high and calories burned. She has learned and gained so much from the sport of running. She enjoys helping educate, encourage and motivate others in the adventures of running. After graduation from Santa Anna High School in 1992, Martha attended Ranger Junior College and continued her education at Tarleton State University. Martha and her husband, Jason, an attorney with the Law Offices of Chastain, Johnson and Broughton, LLP reside in Stephenville, Texas. 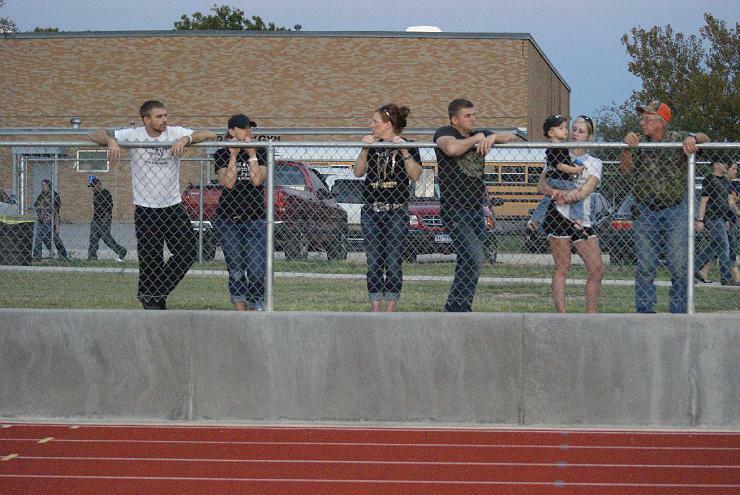 Martha’s family consists of, son, Manny (18) daughter, Aleska (12), stepson, Dane (9) and daughter, Jordan (1). She is most proud of being a mom. Ray Jones is a graduate of the Santa Anna High School, Class of 1992. Shortly after graduation he enrolled in Universal Technical Institute in Houston. He graduated from UTI with a Diesel/Marine Technician Degree in April, 1993. 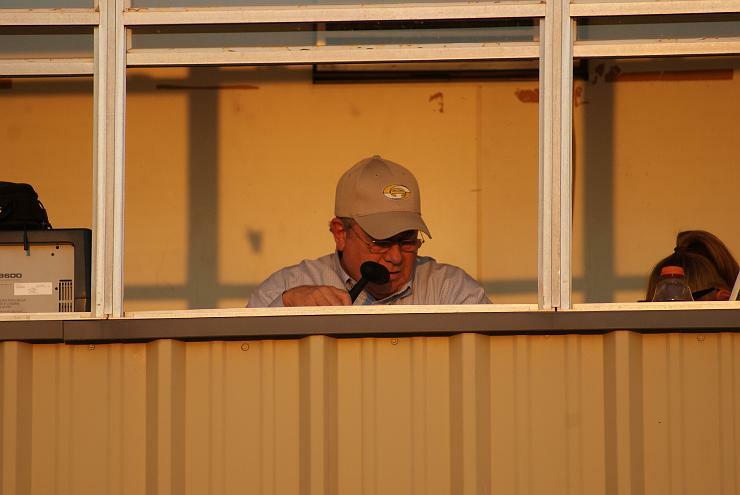 Later in 1993, Ray moved to San Angelo and began working for the Tom Green County Sheriff’s Dept. as a jailer. On Sept. 3, 1994, Ray married his high school sweetheart, Betsy McIver. In Jan. 1995, Ray and Betsy returned home to Santa Anna where he began a tenure in oilfield operations. Ray is currently an Exec. Vice President for Loadcraft Industries, where he has been employed since Nov. 2004. Ray and Betsy have just recently celebrated 18 years of marriage and have three beautiful children--Genia Jones, a junior at SAHS, Jaylie Jones, an eighth grader at SAJH, and Zachary Diaz, a junior at SAHS. Ray enjoys spending time with his family, church activities, and ministering to the youth of the community in many ways. He is an active member of the First Baptist Church Santa Anna where he and his wife have been the youth ministers for the past 16 years and he has served as Deacon for 13 years. 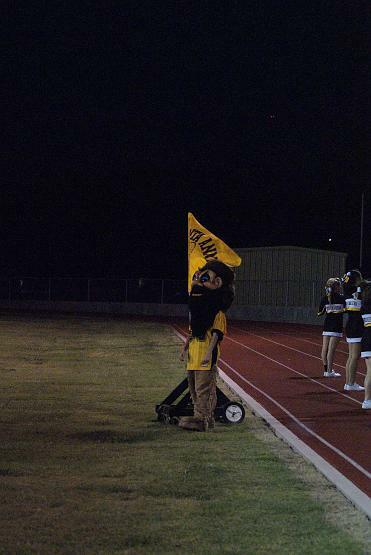 Ray plays an active part in the Mountaineer Booster Club and the Santa Anna Youth Assoc. 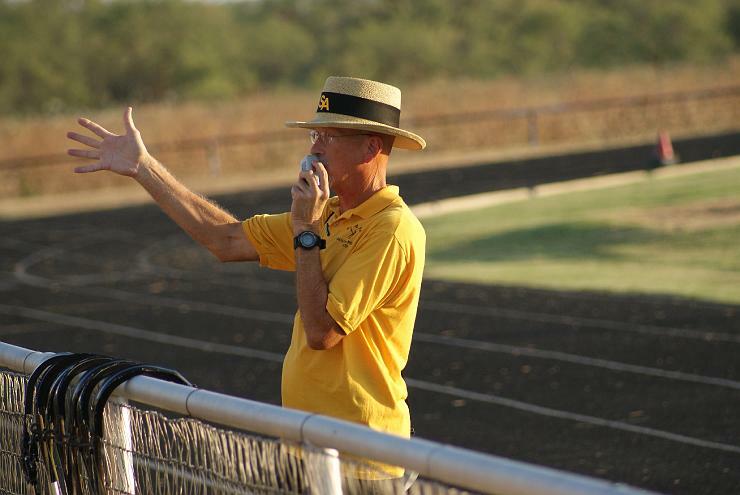 where he has helped revive the softball program and coached for the last 6 years. Ray and Betsy both love and cherish this community and school system. Ray is currently serving as a member of the Santa Anna ISD School Board and Betsy is a Secondary Math Teacher at Santa Anna as well. After Brian's best laid plans to attend the University of Texas went awry because of funding or a lack there of, he worked in the Oil Field for a few months and then returned to the famous Santa Anna Tile Co. Brian worked at the Tile company for three years until he turned 21. At that time, he struck out into the University of Hard Knocks (Oil Patch) to earn his degree. Brian married Glenda Margo on December 15, 1962. They have two children, Tina and Kevin and two Grandsons, Aaron and Garrett. Currently, Brian and Margo reside in League City. During those 33 years at the refinery he had worked as an Operator, Craftsman, Planner, Supervisor and ended his career as the lead planner for the refinery. He was also a Volunteer Fireman at the refinery and fought some spectacular fires. One year during his fire fighting days, Brian was honored as Fireman of the year. Brian uses his planning skills to keep his class together and organizes a get together every year or two. He has 5 sisters and two brothers. His planning abilities also come in handy keeping the family in touch. They have had family reunions from the east coast to the west coast including New Hampshire, Washington, Colorado, and Wyoming. They have also had several reunions in Galveston on the West Beach. After retirement in 1999, Brian and Margo moved to Granbury and did some serious traveling around and through US. They also enjoyed two scenic cruises to Alaska in 2000 and 2008. Although Brian had that University diploma (a/k/a retirement plan), sharp drops in the stock market and boredom brought him out of retirement. 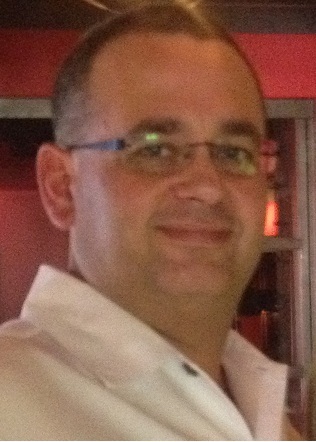 Only 18 months later Brian returned to work for Fluor Engineering Company where he worked for another 10 years. He and Margo moved back to the coast in 2006 and still live there in League City. He tells folks, he failed retirement. Brian has been very active in sports and hobbies over the years included coaching Little League Baseball and football, playing Softball, bowling, white water canoeing and traveling. He continues to be heavily involved at his church through teaching, preaching, and leading Evangelism Seminars. Brian and Margo have been fortunate enough to have traveled to all 50 of the States in the beautiful USA. They love driving through the beautiful USA from sea to shining sea, from the colorful Maples of the New England States to the Redwoods of California, across the wheat and cotton fields in the plains to the Purple Mountains of Colorado and Wyoming. They love photographing the beautiful Texas Bluebonnets the Hill Country flowers in the spring and the awesome valley birds, whooping cranes, and Gulf coast birds. Brian calls his Texas Trips his "Waltz Across Texas" tours. They share their pictures with friends and strangers (anyone who will look at them really). Brian and Margo have also traveled to Europe and across a large part of Canada, but nothing compares to these Great United States. 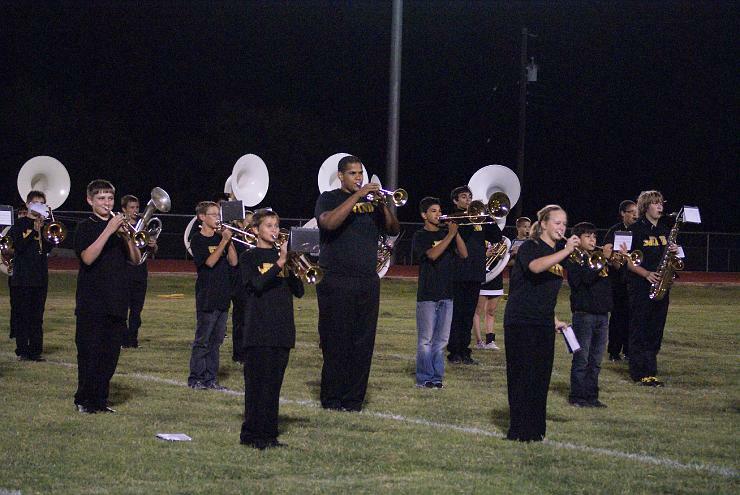 Santa Anna High School’s Homecoming will be held on September 28th. Nominations were recently held and these students were chosen by the student body. 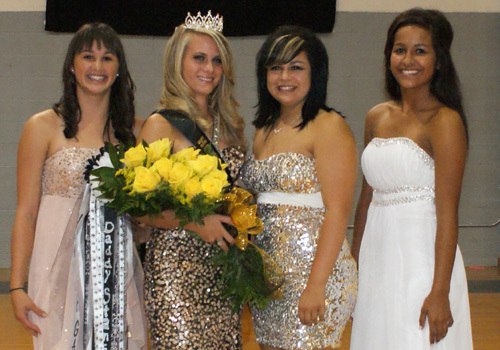 Nominees for Santa Anna Homecoming Queen are Carlee Coats, Kindsey Holland, Hannah Hartman, and Kourtney Guerrero. Nominees for Santa Anna High School Homecoming King are Marcus Valencia, Talon King, Joshua Perez, and Nate Salazar. I have been really busy starting back to college at Tarleton State and haven't had much time to spend on the News, but I caught up on homework and told some of the players I would try to get some photos of games up this week. The Mountaineers defeated the Veribest Falcons 75-28 at Veribest in Zero Week but I didn't make the trip to Veribest as I was oncall at work. In Week One The Mountaineers defeated the Panther Creek Panthers 71-24 at Panther Creek. 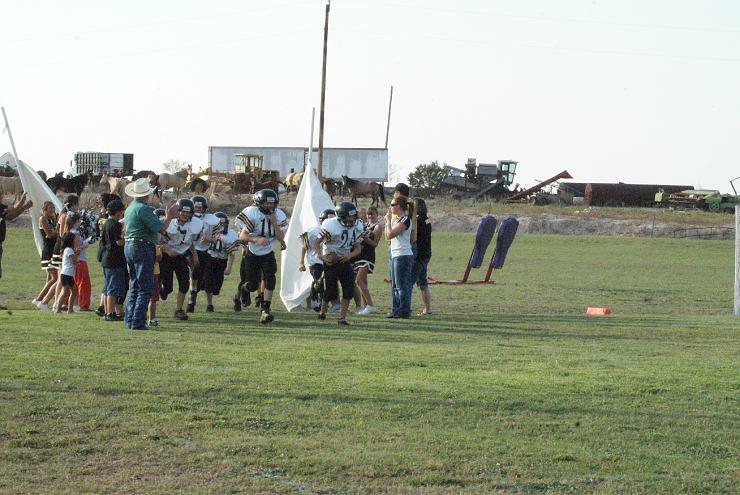 See the Sports page for the rest in the Panther Creek, Paint Rock, Mullin, and Mullin Junior High game photo albums. 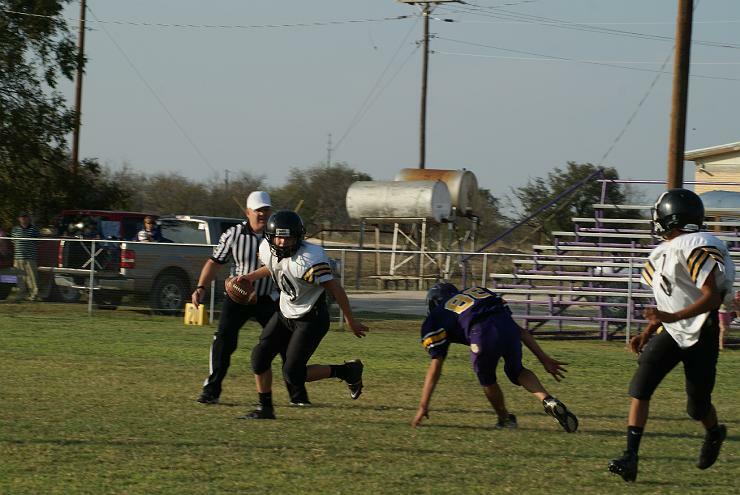 Santa Anna Mountaineers defeated the Mullin Bulldogs 53-8. After a shaky start on defense, the Mountaineers gathered themselves and ended the game at halftime. 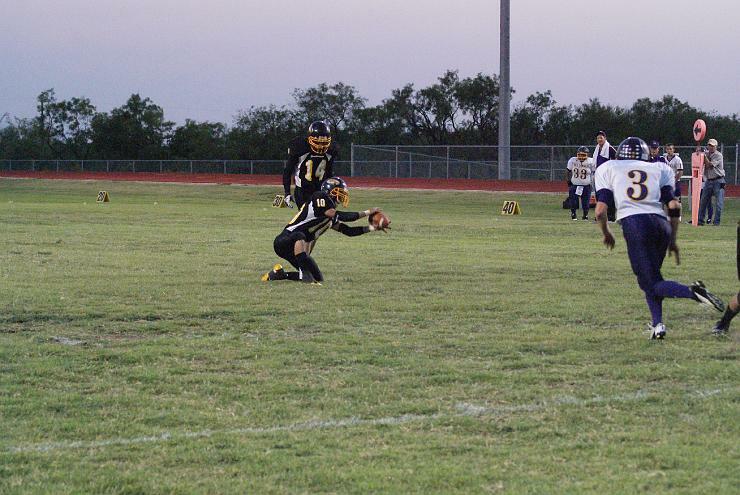 Defensively, the Mountaineers were lead by Nate Salazar who alone had 11 tackles. 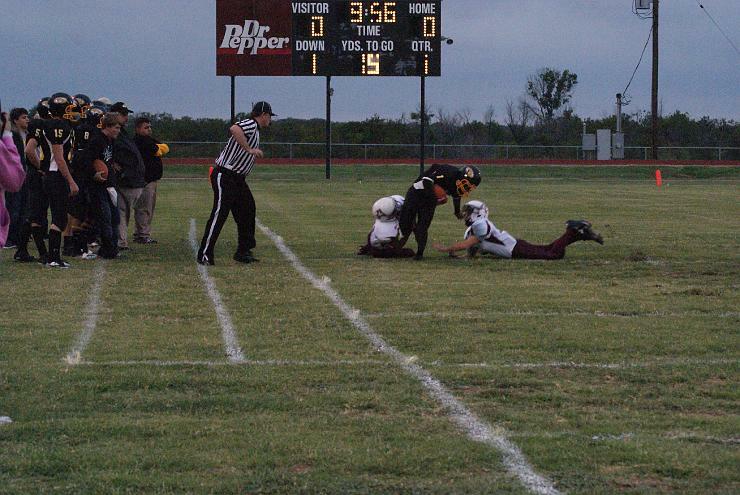 “It is pretty hard to get double digit tackles in a football game; that is pretty special,” Coach Adams stated when he heard of the 11 tackles. 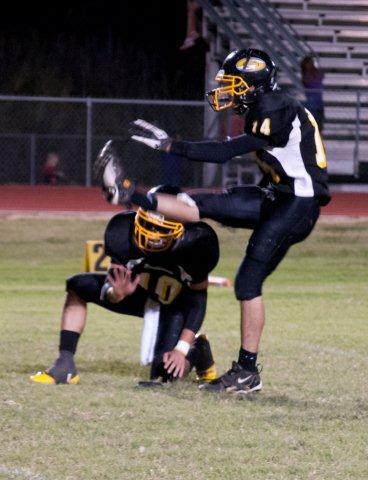 Offensively, Michael Valencia, once again with the help of his teammates, showed what the difference a year can make. 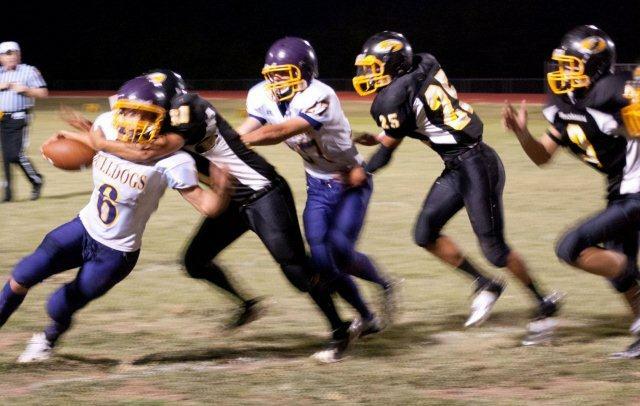 Valencia had 260 yards rushing on only 7 carries. 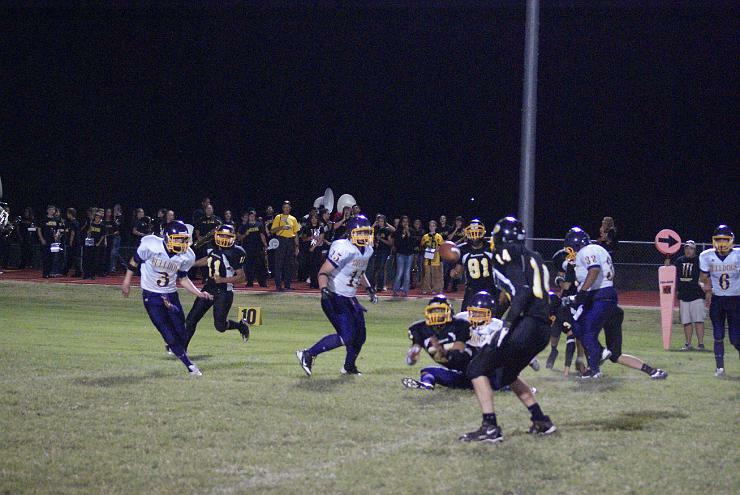 Touchdowns were scored by Valencia, Rhoades, Z. Diaz, and L.Diaz. “The community has something to be proud of. For the first time in a long time, people are paying attention to this small town outside of Brownwood. I am not from here, but I am proud to be here,” Garcia said when he was asked about all the great things that were going on in Santa Anna. 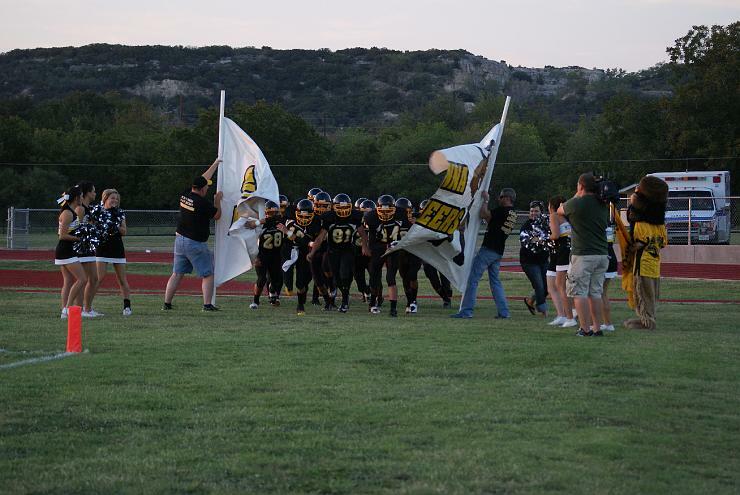 This week is Homecoming week, and the Mountaineers will be working hard to keep their newly found “attitude” going. “We looked at film, and know what Eden has. They have some speed to them. 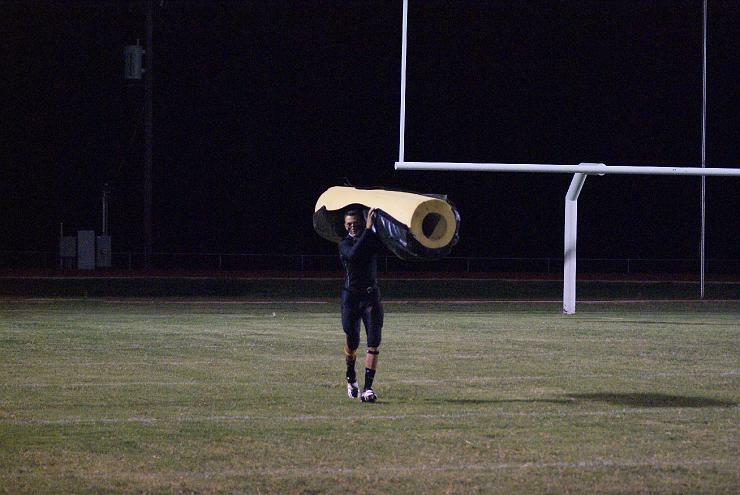 We have to get to work and focus on our task at hand,” stated A.D. Cameron Norris. Kick-Off time is set for 7:30pm. Come early and find a seat. Word is spreading about the Mighty Mountaineers. 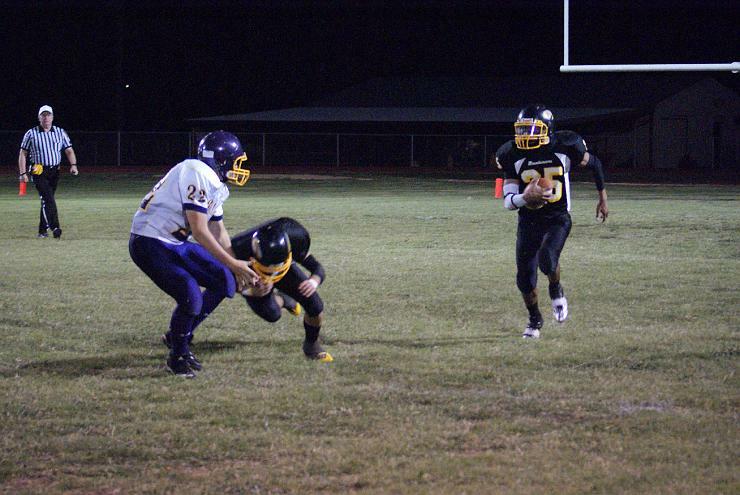 The JV Mountaineer team traveled to Blackwell on Thursday and returned home with another win. 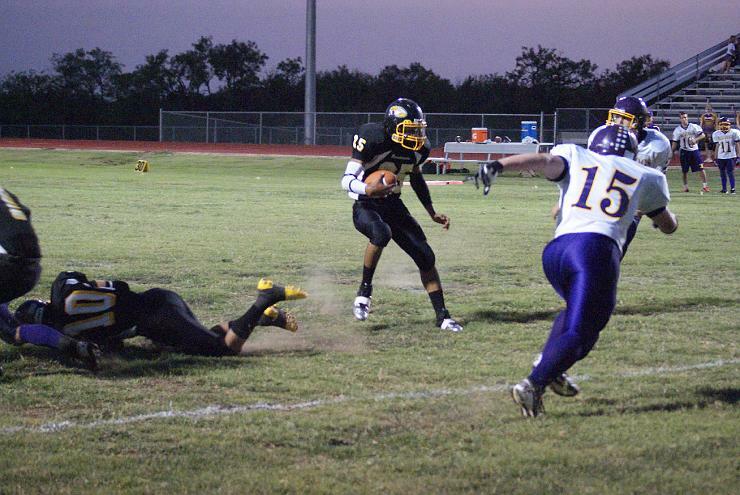 Blackwell improved from the first time they played Santa Anna, but in the end, the Mountaineers came out on top. The Mountaineer offense was lead by Malcolm Smith, and Devon Denton at the tailback and fullback positions. The Mountaineers were able to score 4 times. 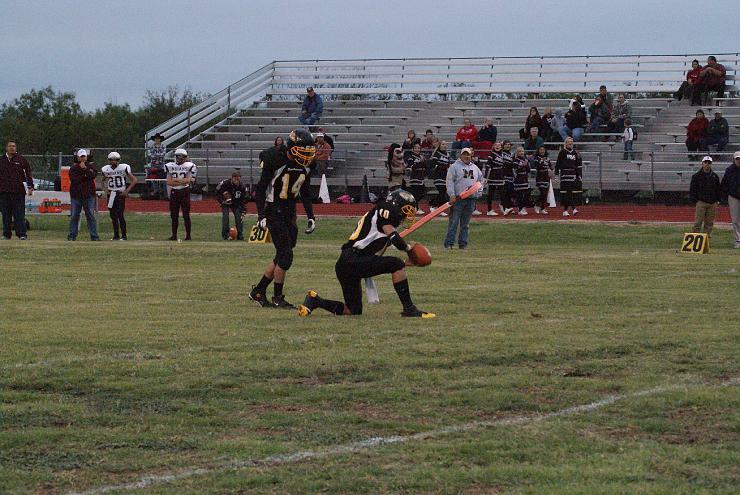 Defensively, the Mountaineers were able to pick off two passes which helped secure the victory over Blackwell. 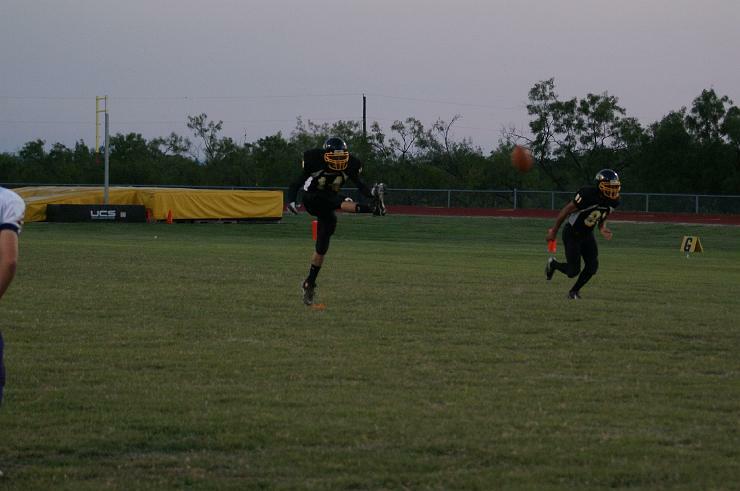 This Thursday, the Mountaineer JV team will be playing at home. 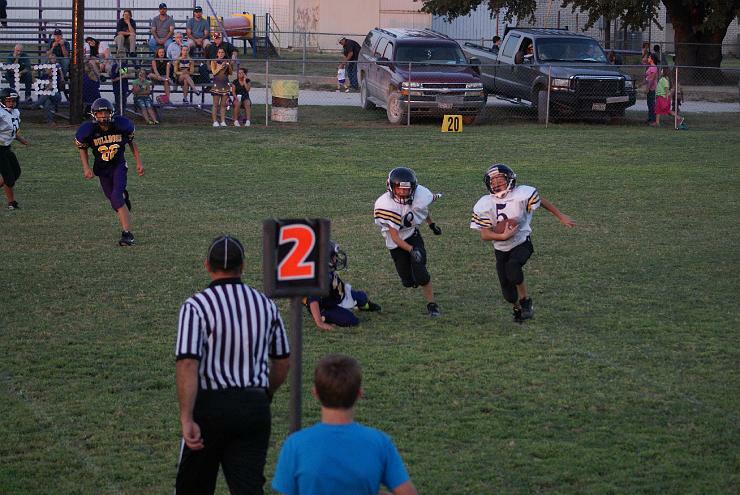 The Jr. High Mountaineers got their second win of the season. 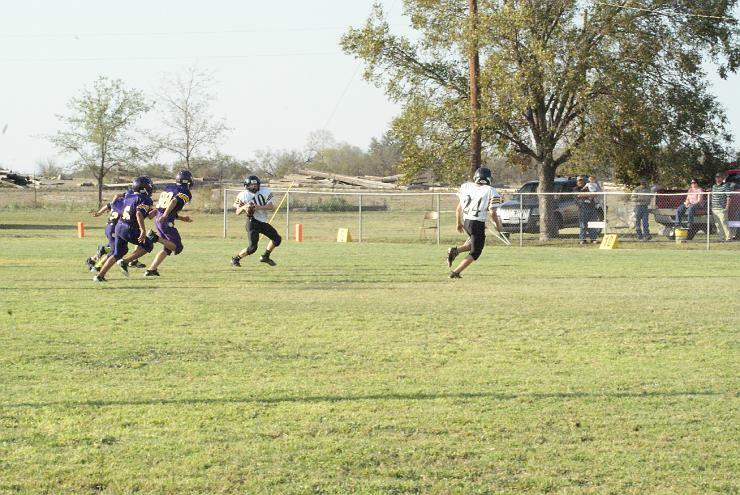 The Jr. high traveled to Mullin Thursday night and were able to hold off Mullin with a score of 48-6. 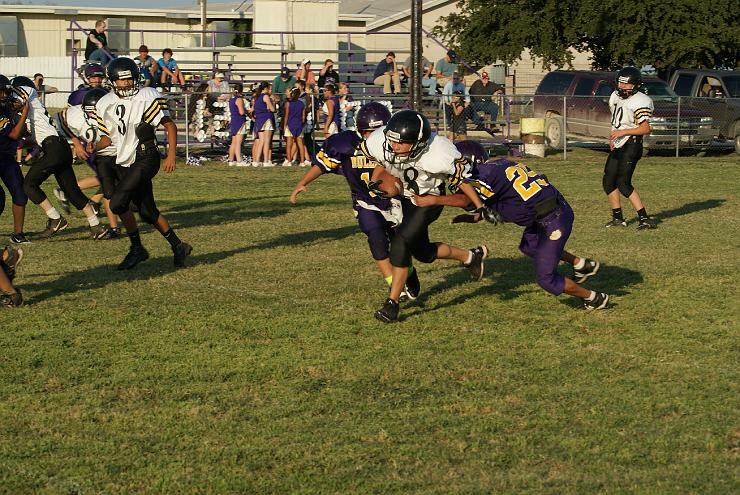 The Jr. High team is learning quickly that defense does win games. The Mountaineers are getting very stingy with points on the board. 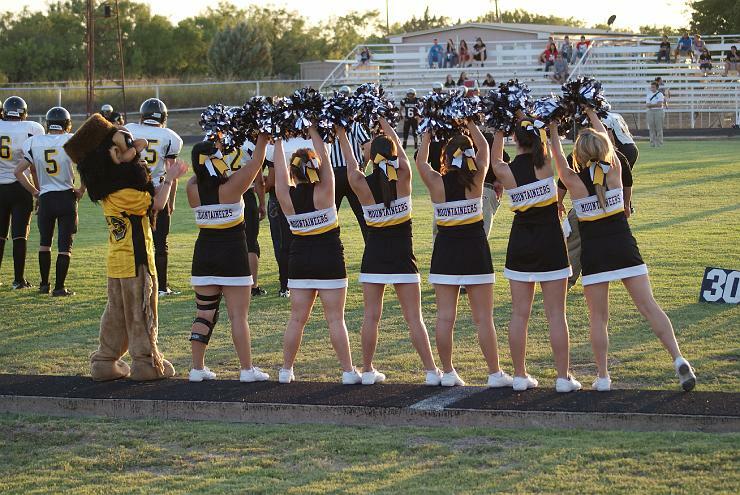 They like to see them on our side, and not on the opponents side. Offensively, Coach Adams is coaching the young men multiple formations and the kids seem to catch on fairly quickly. Don’t be surprised to see even more formations as the season continues. 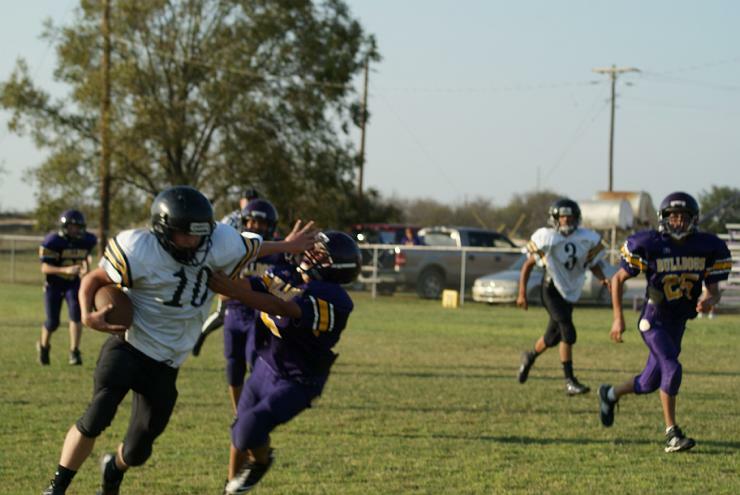 The Jr. High team will travel to Eden on Thursday for their third game of the season. 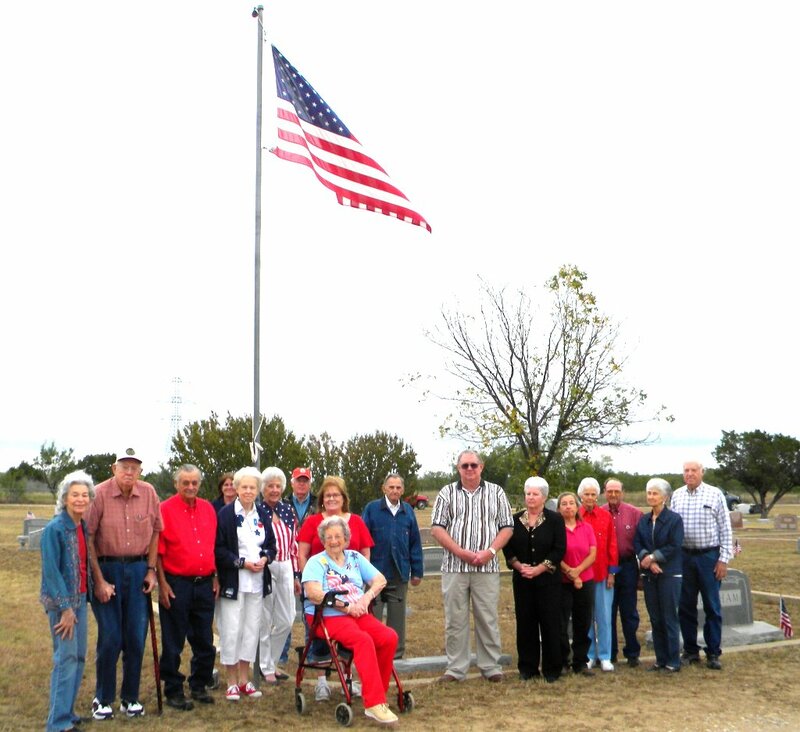 On Saturday September 15, a small group embraced the crisp morning air as they gathered for the Memorial service held at the Rockwood Cemetery before the Homecoming festivities. Billie Gay Abernathy welcomed the group and introduced Retired Colonel Larry Rutherford, who gave a very moving speech, which was richly enjoyed by all present. A prayer of thanks and protection for our troops, along with the playing of taps ended the memorial. Although the crowd was smaller than usual, a lot of familiar faces were present along with new ones to add to the enjoyment of the day. The community center was all decked out in red, white and blue in honor of the theme “Salute to the Troops”. Memorabilia from Miss Linnie Box was displayed. Many pictures of the service men she had written during WWII and patches that had been sent to her from the returning servicemen of the Rockwood area were included in the display. Dale Hibbs gave the blessing and the noon meal was served. All enjoyed barbequed brisket and the various dishes brought by the attendees. No one could walk away hungry and certainly the dessert table had an abundance to choose from. Royce McIver called the meeting of the Rockwood Cemetery Association to order. He gave a report on the condition of the cemetery and any improvements that had been made. Royce introduced the serving directors for the Cemetery Association. Billie Gay Abernathy gave a financial report and then Judi Bryan took over the meeting for the election of two Directors, as Royce’s term was expiring. Donna McIntire made motion to reelect Royce McIver, Yolinda Weston seconded and the motion passed. Next up was election of Faye Wise; Larry McIntire made motion to reelect Faye, Reba Cozart seconded and the motion passed. Royce and Faye will each serve another 2 year term on the Cemetery board. Royce then thanked everyone for coming and adjourned the meeting. Jennifer Rutherford and Kim Bray Whitaker drew for door prizes. Amanda Abels, 2- month old daughter of Michael & Lucy Gregg Abels was given a $50 savings bond donated by Coleman County State Bank for being the youngest in attendance. Next was the drawing for the hand sewn quilt made by the ladies of Rockwood. The winning ticket was read with Joyce Ralston being the lucky winner. A silent auction of the many donated items from local businesses was held along with a live auction of some very special items. One item of interest was a mesquite desk set that was given by Travis King. He had made the item from a mesquite tree that once stood on the original Rockwood School grounds. Lots of laughter and bidding wars were enjoyed by the crowd. Special thanks go out to the many merchants that donated items for the Homecoming; Santa Anna National Bank, Coleman County Telephone Cooperative, Inc., Coleman County Electric Cooperative, Coleman Interbank, Coleman County State Bank, John Morris Travelers Treasures, Guthrie and Son, Grammer's, Shirley’s Originals, The Quilter’s Patch, Petal Patch, Leather and Lace, That Santa Anna Store, Barb-D-Wire Babe, Life’s Delights Photography, Mesquite Time, Tyson Pharmacy, The Bargain House, Earl Smith Jewelry, Southern Charm Antiques, Owl Drug Store, and these individuals who donate their time and handiwork for Rockwood: Gary Whitaker, Sharon McCreary Lee, Travis King, and Yolinda Weston. Thanks go out to Jennifer Rutherford, Jimmie Gail Davis, Kim Whitaker and Billie Gay Abernathy for their work on “The Salute to the Troops’ decorations and preparations for the Homecoming activities. The committee expresses a special thank you to Ret. Col. Larry Rutherford for his time and the speech he presented at the cemetery. Please remember to mark you calendars for next year. We hope to see you there, to once again remember the days of Rockwood and all the wonderful people who once were and are still a part of this small but much loved community. 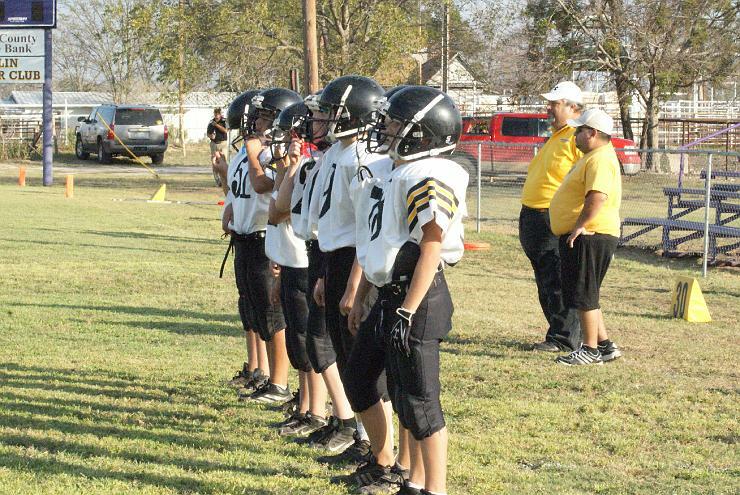 The 2012 Santa Anna Jr. High Mountaineers are ready to take on the Mullin Jr. High Bulldogs in Mullin, after their 32-6 victory over Paint Rock last week. 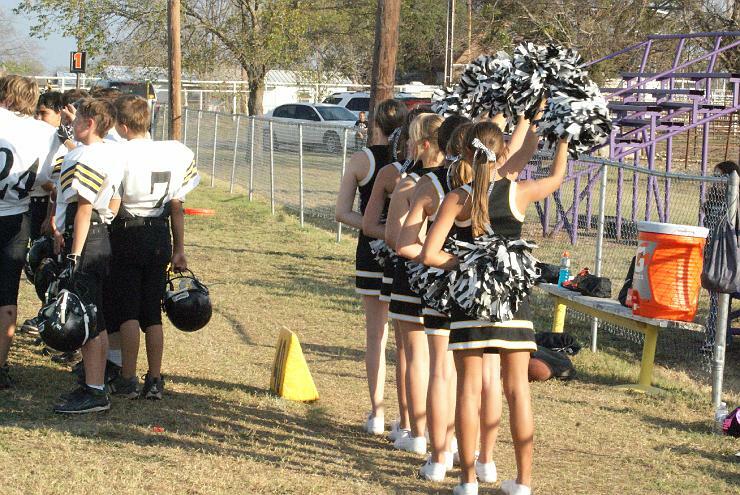 The JV is following in the footsteps of the Varsity football players. 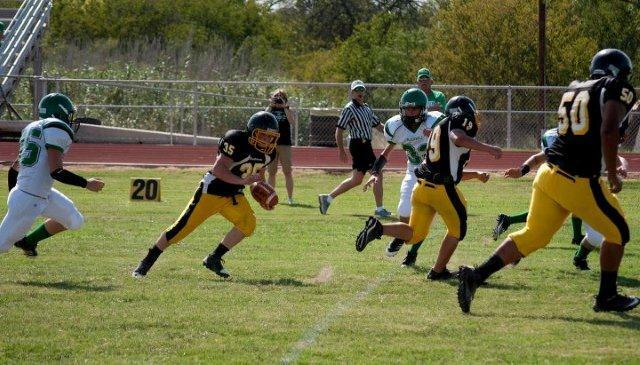 The JV has started off to an undefeated season as well. The boys are playing hard and preparing even harder as they face off each week against the varsity. Several of the players have mentioned that facing the Varsity Team is a great way to prepare because the Varsity team does not take it easy on them. The JV Mountaineer team is averaging 45 points a game and will face Blackwell this week in Blackwell at 6:00pm. 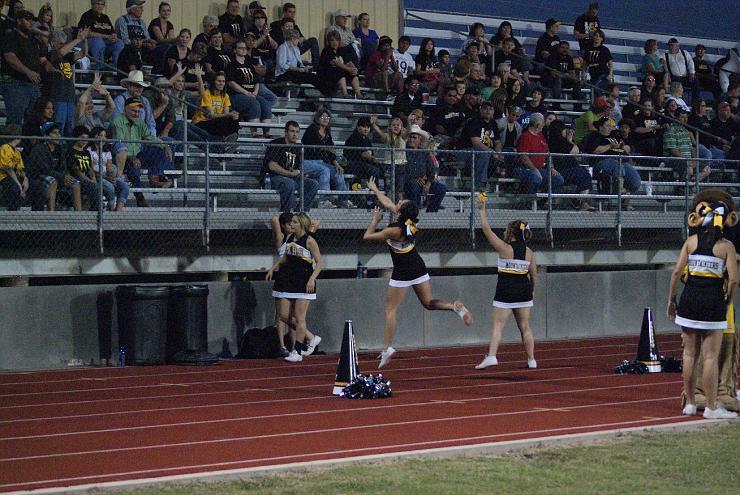 The Mountaineers defeated Blackwell in their first meeting. 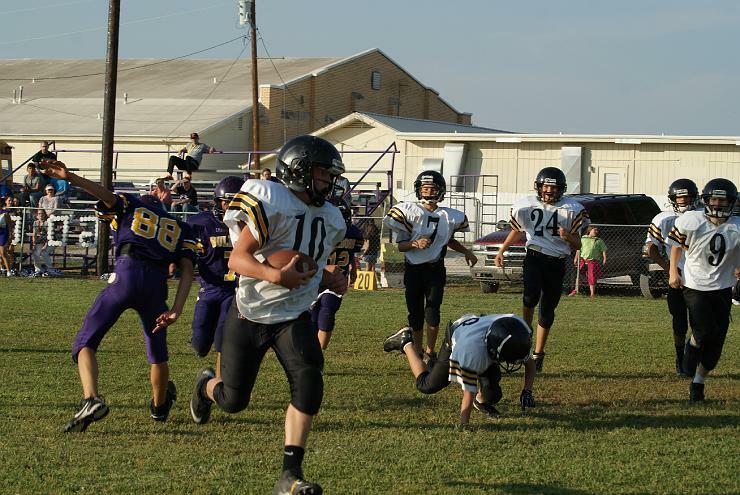 The Junior High Mountaineers opened their season with a great win over Paint Rock. 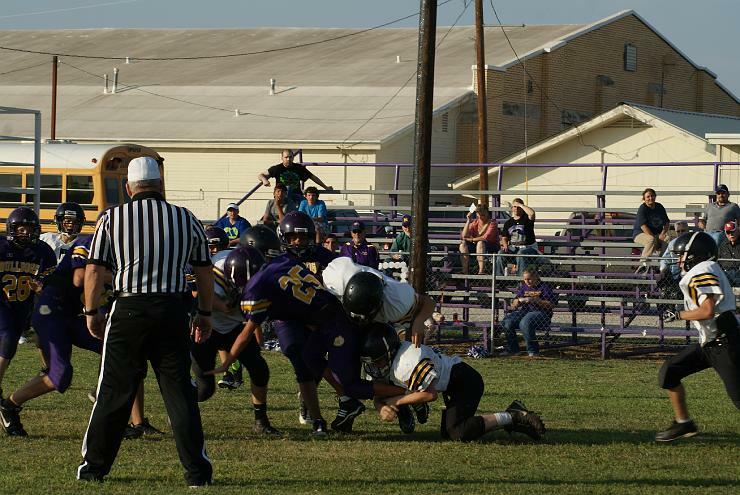 Paint Rock had more players and were bigger, but the heart of the Jr. High prevailed as the Jr. High brought home their first victory of the season. 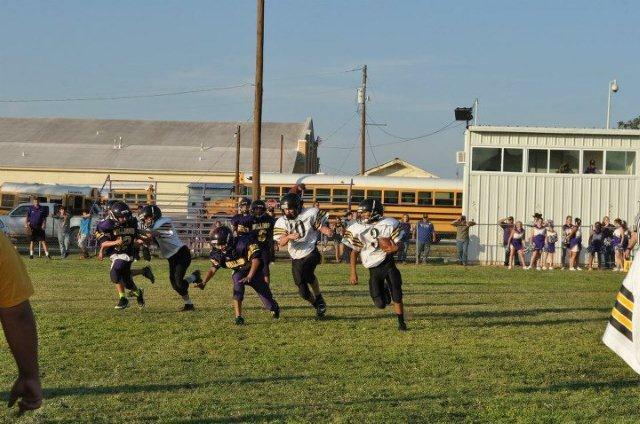 The Jr. High plays this week against Mullin at Mullin game is scheduled to kick off at 6pm. 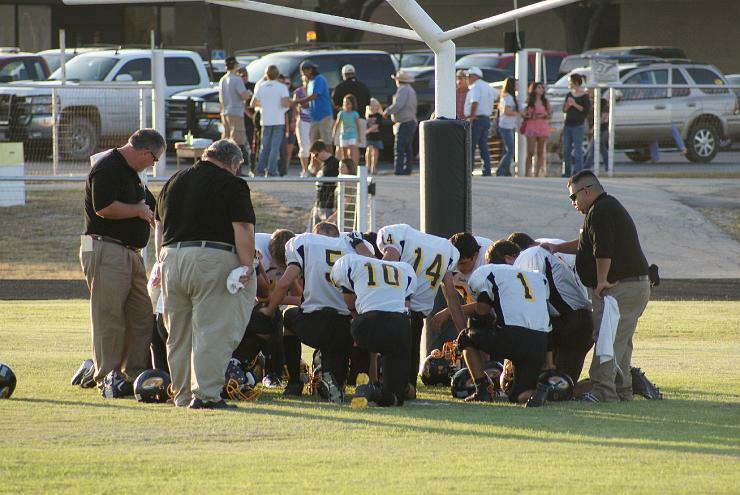 Santa Anna FCA and The First Baptist Church of Santa Anna are teaming up in this year's Prayer at the Pole. 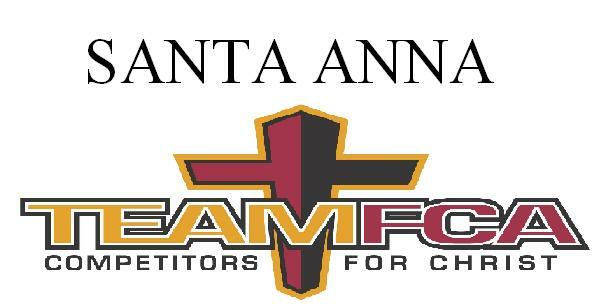 This will mark Santa Anna FCA's first event of the new school year. All are invited to attend and gather in front of Santa Anna High School at 7am on September 26th. 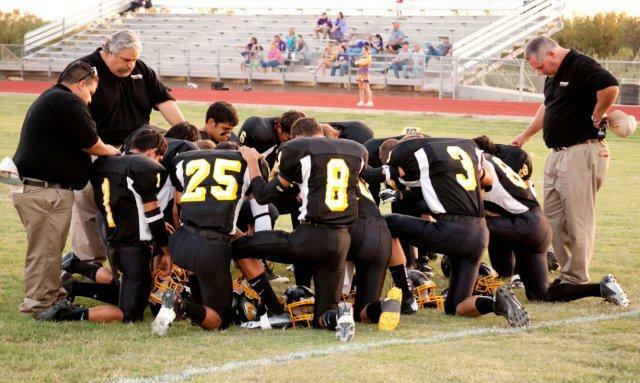 Also be on the lookout for more events, and community services by Santa Anna FCA. Mountaineers start off the season at 3-0. 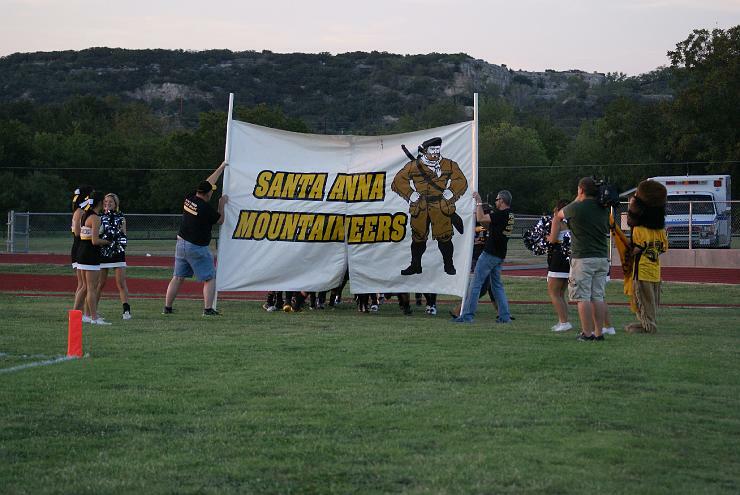 The Santa Anna Mountaineers are off to a quick start and are still undefeated after beating Paint Rock 46-0. 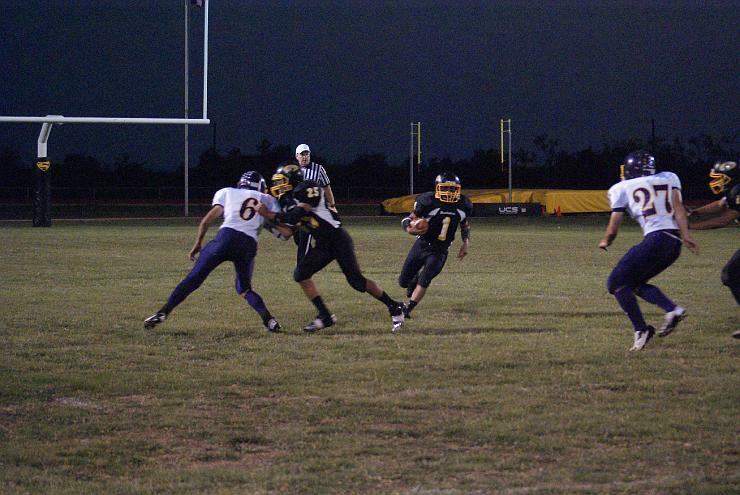 The Mountaineers were lead by Junior tailback Michael Valencia. 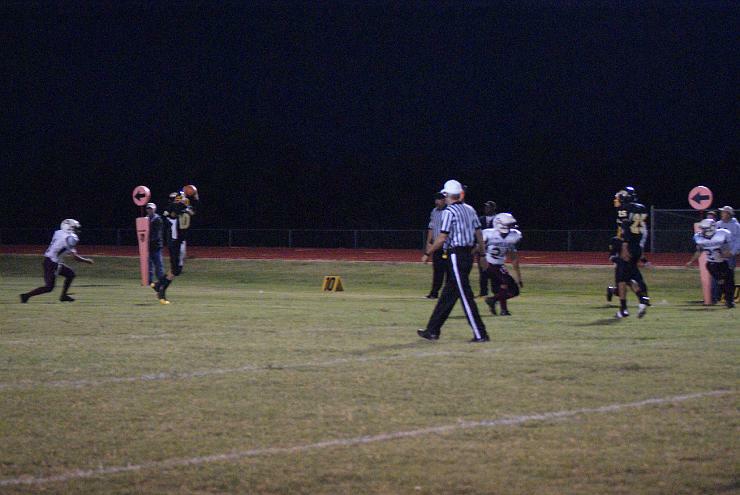 Valencia accounted for 4 touchdowns in the game. 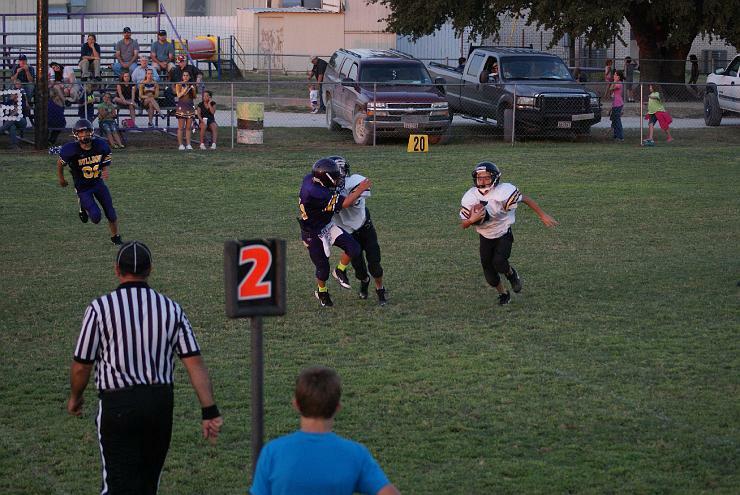 Sophomore Lucas Diaz put up a couple of touchdowns of his own. 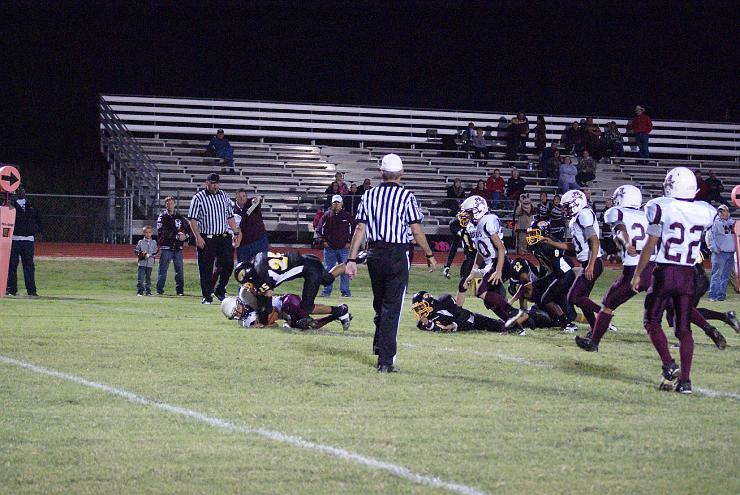 The Mountaineer defense was rather stingy by not allowing Paint Rock to get a single first down. “The boys are playing different this year. After a growing season last year, I think the boys have realized what kind of potential they have in them. They are playing unselfish ball, and hard hitting ball. We are in the weight room everyday getting bigger and stronger. 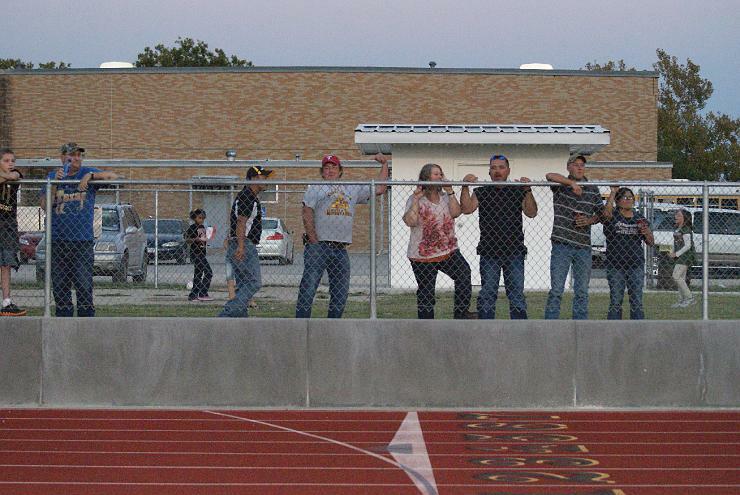 We (the coaching staff) are very pleased with what the boys are doing on the field and also at school. 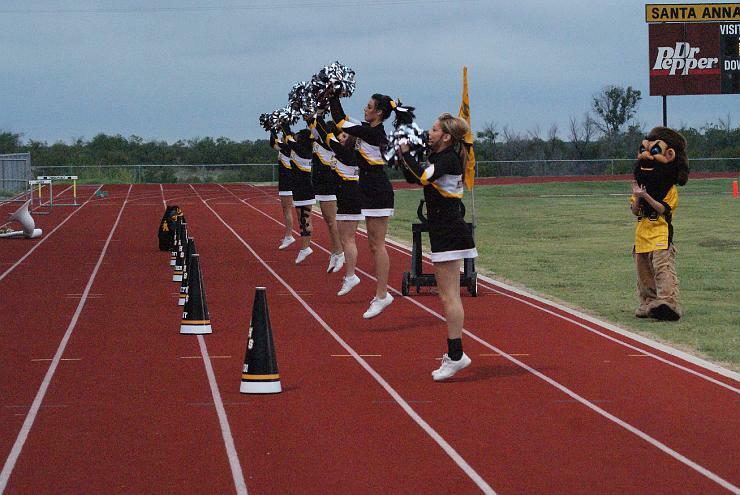 Teachers and administration are giving us compliments on the positive attitudes from the football team,” said Coach Garcia. The Mountaineers will be tested on Friday as they face Mullin in a battle of undefeated teams. Mullin will come into Mountaineer Stadium averaging over 70 points a game. “They are a stout team. They have a pretty good true QB and TB. 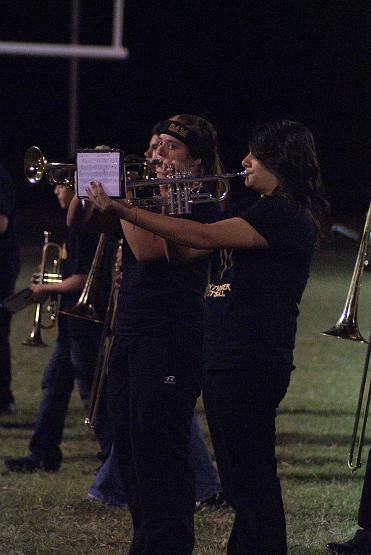 They are doing something that is working for them if they are averaging 70 points a game,” stated Coach Garcia. 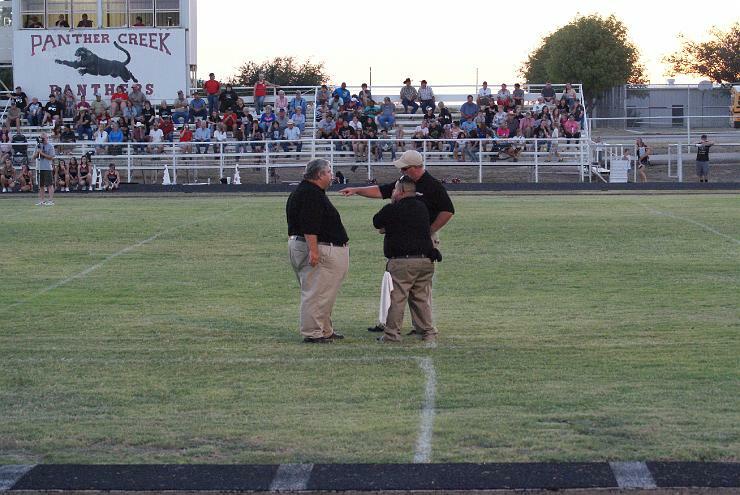 Kick off time is at 7:30 in Santa Anna. Mountaineer rushing game with 155yds on 14 carries with 2 touchdowns. 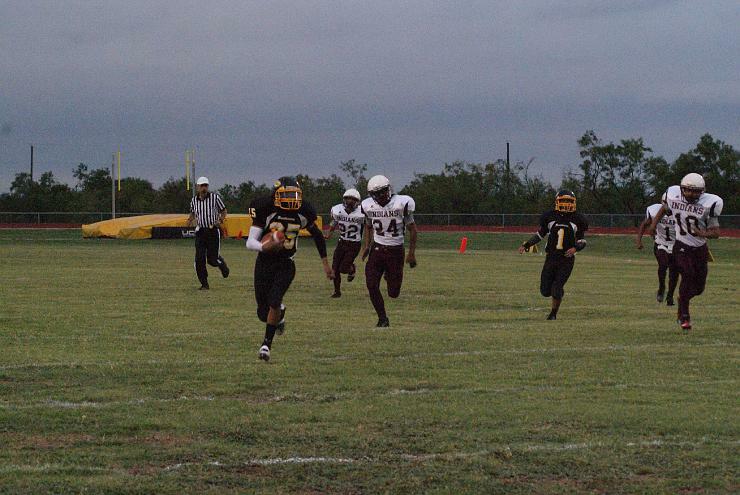 Sophomore Lucus Diaz added two touchdowns on 7 carries with 134yds. 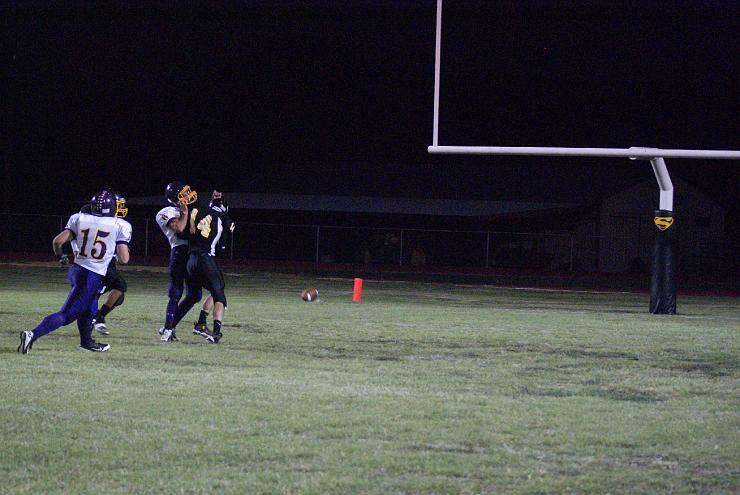 The passing game was also in effect as Senior Mikey Rhoades scored on passes of 50 and 53 yds. 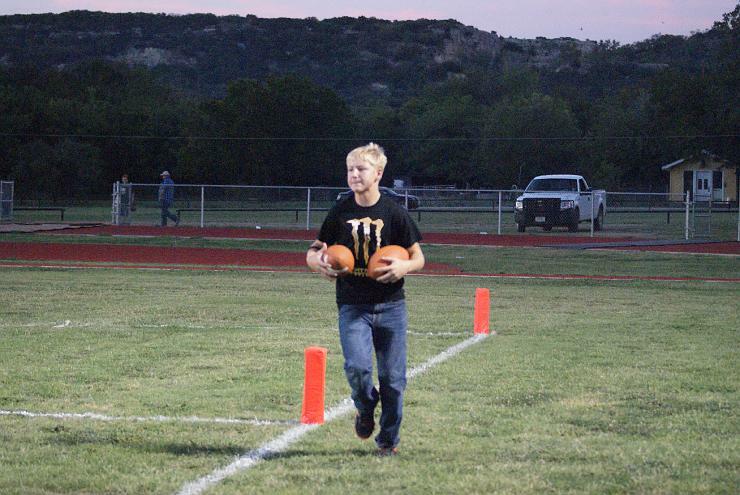 The Mountaineers also used their special team talents to score on kick off returns and punt returns. Defensively, the Mountaineers were pretty much in control the whole night. 2 big plays from Veribest moved the game past halftime and into the 3rd quarter. 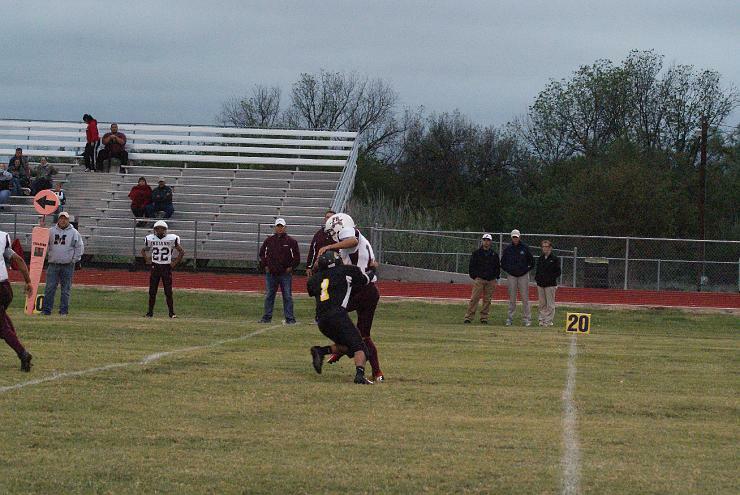 Michael Valencia and Nate Salazar lead the team with 6 tackles each. 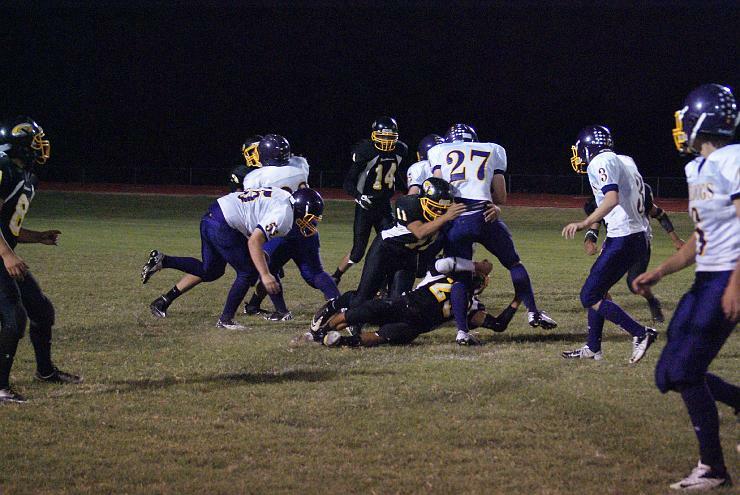 Sophomore Colby Nelson had 5 tackles. Up next for the Mountaineers will be Panther Creek. The game will be in Panther Creek, Thursday, September 6th at 7:30pm. This looks to be an exciting game renewing a long time rivalry between the two schools. 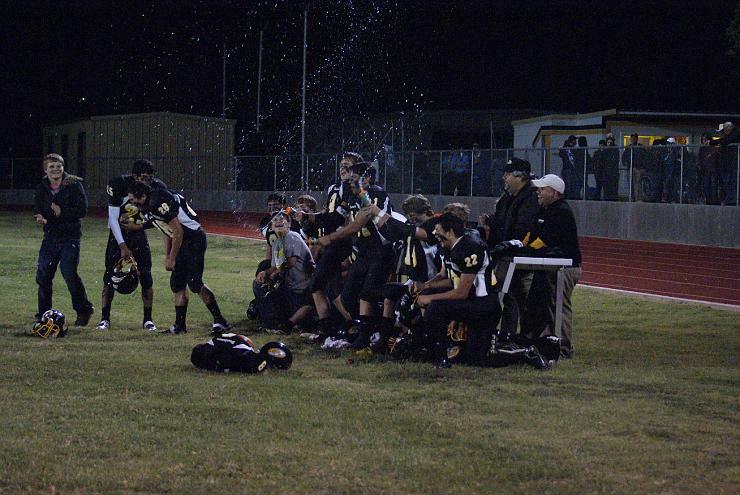 From Coach Norris: It was a good win for the boys. We came out swinging, but mental mistakes were made and kept Veribest in the game for a while. We did some things very well, but there are still plenty of things we will be working on and improving on.